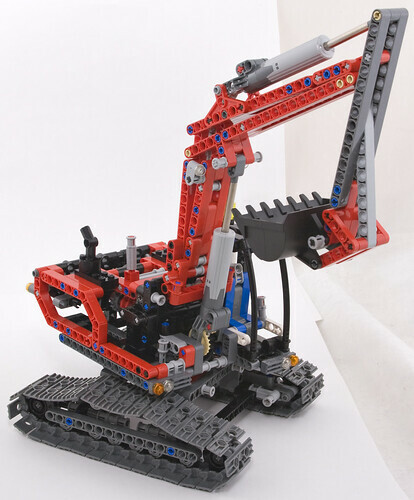 I had the Lego #8851 Pneumatic Excavator when I was a kid (and still have all the parts, natch), so when I noticed that Kmart here in Australia is currently selling the new and exciting #8294 linear-actuator Excavator for only $AU54 (US list price $US60! ), I had to get one. Because the Excavator has only two actuators - the old pneumatic one had three - its bucket-hinge action is linked to the end segment of the arm. This makes it a bit less playable. Apart from that, though, the new excavator is brilliant. I miss the more expensive old-style packaging you used to get with Lego; now each set is just a flimsy box full of bags. But I don't miss the old studded-beams Technic Lego itself at all. The new stuff makes it much easier to pack tons of mechanism into a small space, and if you just chug through the instructions without spending a lot of time puzzling over what in fact it is that you're building, it's a wonderful surprise when you stick it all together and suddenly find yourself looking at a freakin' gearbox. The gearbox uses some specialised parts that've been around for years, but were new to me. In this case, they give you a shift lever with a neutral position in the middle, and either end of its throw linking a gear on the back of the Excavator to one of the two actuators. The new excavator has those new chunky tracks I was talking about the other day. Unlike the somewhat fragile old-style gear-drive tracks, the new ones are deliberately made to not hook together terribly strongly. So if you twist the track a bit, one of the links will click apart. That may put a kink in your plan to use these tracks for heavy-duty off-road motoring, but it may also cause your new Lego Panzer V to throw tracks about as easily as the real one did. The #8294 excavator also comes with several stickers you're supposed to put on the pieces; I of course did not even glance at them. And it's got this unusual giant tile piece, which is only used in the alternate model. Lego have cut costs here, as well; you don't get instructions for the second model in the box, but have to download them instead. I'd normally complain about this, since downloadable extras can reasonably be expected to not be available ten years down the track. But there's pretty much zero chance that it'll happen in this case; the fan community will provide, if Lego ever don't. This is seriously an awesome kit. I bought it for the actuators, as I knew it would be nigh-impossible to have motorized steering without either a servo motor (expensive) or massive gearbox (clunky). The actuators are perfect for the application. Although I do miss the old studded brick. It made some things easier due to the fact that you could just stack them, plus it was easier to visualize what you were building. I got it this week, just because I knew I had to play with the actuators. It's an amazing kit; a 1000pc Technic set for fifty or sixty bucks is something that I'm still trying to wrap my mind around. I agree with #2, there is definitely still a place for the studded Technic beams. The current system is great for specialized things like this, but I think it'd be much more difficult for a kid to come up with a functional creation of his/her own. And of course, a mixed Technic/solid model with parts like this is very difficult to achieve. Like the pneumatic/linear actuator situation, I think there's an important place for both, and I hope there are future Technic kits that are studded-beam-focused. 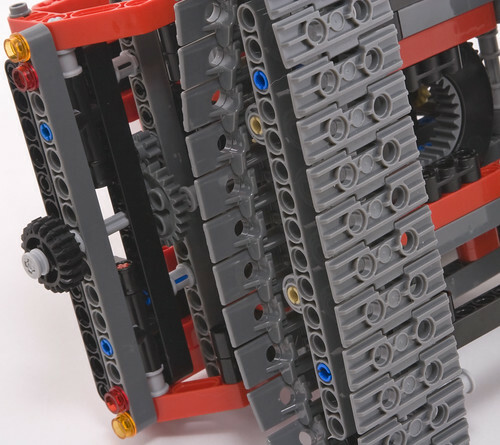 "I agree with #2, there is definitely still a place for the studded Technic beams"
Something like this is a step in the right direction, combining the strength of both Technic paradigms. Curse you, Dan! I went to K-mart today intending to buy the excavator, but instead, I walked out with the 8297 offroader instead! Oh, I was also _profoundly_ impressed by how well Lego is integrating motors and battery packs now. Truly, the envelope of the thing does not change at all after motorization. Yes - but I don't have any Power Functions motors, so I think I'll motorise the excavator by hanging one of the big chunky 4.5V "Basic" motors off the back. I think I'll use a yellow one :-). If you're just after the new-style treads and wheels to drive them, by the way, then the value-for-money winner is clearly set 7645, the "MT-61 Crystal Reaper" from the "Mars Mission" line. It's got a list price of $US50, but gives you seventy of the new Link Treads (in black instead of the Technic grey), and six large drive wheels, which can only otherwise be found in the monstrous 8275 Bulldozer (which is $US150, but has motors and 84 grey tread links). 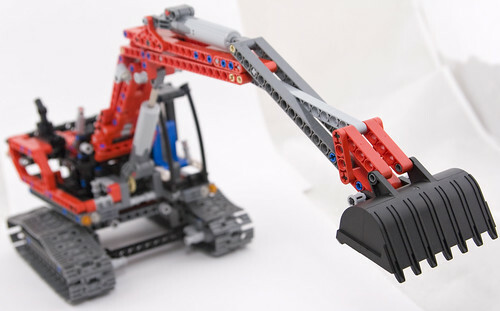 The 8294 Excavator lists for ten US dollars more but gives you only sixty tread links and four small drive wheels. The Crystal Reaper even has some other Technic pieces - pins, gears, liftarms and even old-style studded beams, plus oddities like the three-axle bush. It's got a lot of spacey pieces as well, but it's surprisingly close to being a Mislabeled Technic Parts Pack. If you can get it for 20% off or something, do not hesitate. I've recently gotten back into Lego and picked up the "Cherry picker" model, although I assembled the alternate model (A flatbed truck) in part because I've actually driven a flatbed truck. (Yeasty old Ford F-600 with 3+low "rock crusher" gearbox.) It too used the huge plate, as a truck bed. 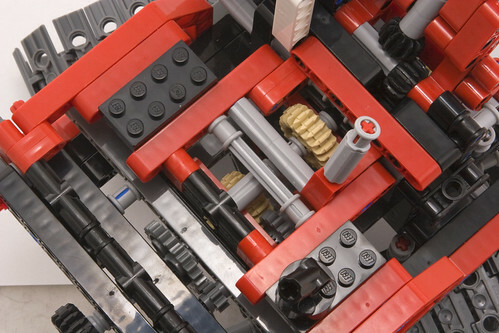 I was surprised how much technic had changed; there was actually a clutch included that HAD PRINTED ON IT HOW MUCH FORCE IT WOULD LET THROUGH. This fairly well blew my mind. Ah, but tracks. They have always been a problem. They were only included in the sets I could never convince people to buy me as a kid (the largest set I was gifted with was 6984 Galactic Mediator) ... I once tried to stretch a thin tire over two small wheel axles... that didn't turn out well. But dammit, now I WANT to build a Lego Panzer V. I also could make a good 20mm Vulcan cannon out of long rods and several thin pulleys. Properly adapted it could mate to the small motor and even turn! I lusted after that 8880 when I was in middle school. A few years ago I found one on eBay, unopened. Worth every (very many of) penny.